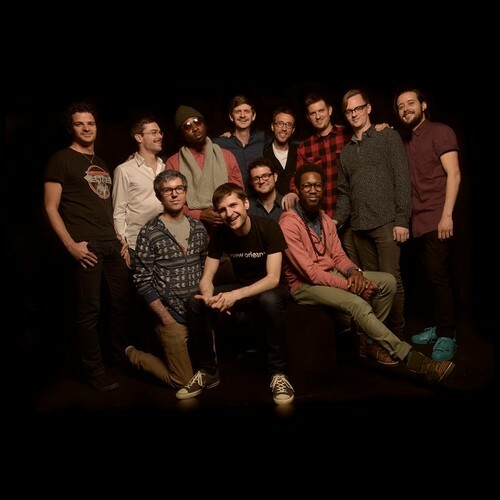 Snarky Puppy is a Brooklyn, New York-based instrumental ensemble led by bassist, composer and producer Michael League. Crossing several genres of music, League describes Snarky Puppy as "a pop band that improvises a lot, without vocals". The band was formed in Denton, Texas, in 2004, and consists of a shifting coalition of nearly 40 musicians, referred to as "The Fam", who perform on a variety of instruments, including guitar, piano, keyboard, woodwinds, brass, percussion and strings. Many of the current and former band members were once students at the University of North Texas. The core touring group is Michael League, Robert "Sput" Searight, Nate Werth, Larnell Lewis, Shaun Martin, Cory Henry, Justin Stanton, Bill Laurance, Bob Lanzetti, Chris McQueen, Mark Lettieri, Mike Maher and Chris Bullock. They have performed with Erykah Badu, Marcus Miller, Justin Timberlake, Kirk Franklin, Ari Hoenig, Roy Hargrove, and Snoop Dogg. While touring, the band has given over 100 clinics, workshops, and master classes in the United States, Canada, the United Kingdom, France, the Netherlands, Germany, Belgium, and Mexico. Snarky Puppy released their debut album, The Only Constant, in 2006. Their first three albums were released under Sitmom Records. Since their fourth album, Tell Your Friends (2010), the band has been signed to Ropeadope Records. The album We Like It Here was performed and recorded live in October 2013 at the artistic compound Kytopia in Utrecht, Netherlands. It was released in February 2014, debuting at No. 1 on the iTunes Jazz Charts. On January 26, 2014, Snarky Puppy, along with Lalah Hathaway, won a Grammy Award in the Best R&B Performance category for their rendition of the Brenda Russell song "Something" from Family Dinner - Volume 1.